Let’s Do Something about Corporate Welfare and Crony Capitalism! The American Enterprise Institute is one of my favorite Washington think tanks. It defines its mission as “research and education on issues of government, politics, economics and social welfare.” I especially like its interest in social welfare which translates for me as being fiscally conservative with a heart. Health Care: repeal Obamacare’s insurer bailout (the “risk corridors”) so that health insurers compete totally on price. Health Care: end the individual mandate which forces people to buy a product from a private industry. An alternative incentive for individuals to remain covered would be limiting enrollment periods, for example, to a brief six-week sign-up period every two years. Energy: end tax breaks and subsidies for both renewable energy (including ethanol) and oil and gas. Make all forms of energy compete in the market. Taxes: make corporate taxes simpler, lower and more neutral. Besides being fairer, such changes will boost the economy. Finance: Rein in Fannie Mae and Freddie Mac by treating them the same as all big banks. This means the same capital requirements, the same tax treatment and the same consumer protection regulation. Finance: Kill Dodd-Frank’s too-big-to-fail designation. It acts as a moat, protecting the big guys from competition. 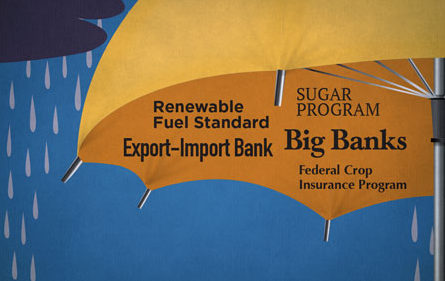 Trade: Kill the Export-Import Bank. Trade: Repeal the Jones Act. It requires all shipping between U.S. ports be done on U.S. flagged vessels. Agriculture: End the Sugar Program which costs consumers $3 billion per year. Agriculture: Reform the Federal Crop Insurance Program by making it self-supporting. These mostly well-known examples of corporate welfare represent just the tip-of-the-iceberg. Nevertheless they provide a good place to start in cleaning things up! This entry was posted in Agriculture, American Enterprise Institute, crony capitalism, energy, Finance, health care, Jack Heidel, Timothy Carney, Trade and tagged agriculture, corporate welfare, crony capitalism, energy, Finance, health care, jack heidel, trade by jackheidel. Bookmark the permalink. Let’s also end subsidies to corn growers and ethanol production.